It is a hard fact that no matter how healthy or unhealthy you are, nothing can be done to stop the aging process. Yet, by adopting certain healthy habits as early as possible you can slow the aging of your body. Just pick some of them and then stick to it without fail to get positive results. As you age, staying active by making exercise is an important part of your daily routine. You can plan an extensive exercise routine, just like walking, if you do not have time to go to the gym. 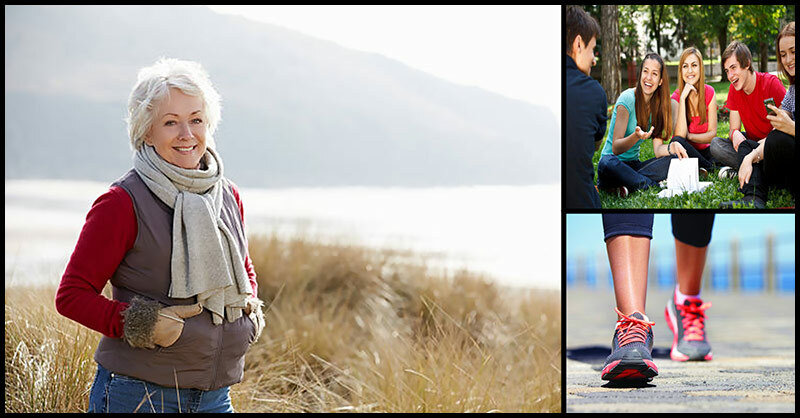 Walking is one of the most effective forms of exercise for people of all ages and fitness levels. It helps you stay fit, which in turn help boost your immune system, promote the growth of new brain cells, and neutralize free radicals. In order to give your body a fresh oxygen, you can have a 30-minute brisk walk in the morning in an open area. Too much exposure to the sun can cause skin damage and lead to wrinkles, sun spots, sagging skin, and a higher risk of skin cancer. You can prevent visible aging signs with regular use of a sunscreen lotion. Just apply a good broad-spectrum sunscreen with SPF 30 or higher. You should apply it every single day, even if it is cloudy or before going out during the peak hours. What is good for your skin as well as for your body is an exposure to an early morning sunlight for 15 minutes daily. The National Sleep Foundation recommends that adults should snooze for seven to nine hours each night as this can lower the risk of diabetes, obesity, and heart disease. Plus, naps can help improve your memory. Sleep can also impact your skin’s health. When you sleep, your body releases several hormones that help in restoring collagen and elastin, which are the essential building blocks of healthy and firm skin. Instead of treating sleep as a luxury, treat it as a basic human need. Get seven to eight hours of sound sleep after a long day of hard work. Listening to some soothing music, doing a ten-minute meditation, or taking a bath before going to bed can help you sleep better. It is so important to follow a proper skin care routine as aging first shows in your skin first. Moreover, it is necessary to keep your skin well moisturized in order to keep it hydrated and soft. Aside from this, regularly wash your face with a gentle cleanser twice daily to keep your skin free from dust, dirt, and other irritants. Never go to bed without removing your makeup as it can lead to blockage in the skin pores and cause aging signs. Plus, exfoliate your skin gently once a week to get rid of dead skin cells. Lastly, always use the right makeup products for your skin type. Having a particular hobby can help you live longer and healthier. It has been linked to a lower risk of hypertension because it helps release tension and stress. In addition to this, a hobby tends to make you happier especially if you are spending time doing an activity that you love. Excessive drinking causes premature aging as it depletes the body’s level of vitamin A which is an antioxidant required for the production of collagen. Because alcohol is a diuretic, it causes dehydration of the skin and body. A dry skin is more prone to premature aging signs like fine lines and wrinkles. Consumption of alcohol also increases a person’s risk of melanoma and non-melanoma cancers, according to a 2014 study published in Cancer Causes and Control. Smoking is another bad habit that leads aging signs at an early age. Smoking tobacco leads to accelerated skin aging, high blood pressure, infertility, and risk of cancer. You must be positive towards life for you to stay physically and emotionally healthy. It can also help you handle challenges more successfully. However, dwelling negative thoughts can lead to stress and other painful emotions. It would be better if you would keep a positive mental attitude towards life as it can help you stay forever young. Stress is caused by an endless number of things. You must learn to keep it under control. Excess stress can cause skin aging at the cellular level which leads to damaged DNA, the breakdown of collagen, and promote the release of pro-inflammatory factors that can accelerate the aging process. It can also cause a lot of chronic diseases which include obesity, heart disease, and high blood pressure. Try deep breathing or meditation for you to manage your stress. Meditation helps calm your body and mind while deep breathing aids in circulating more oxygen throughout your body. Studies have linked active social life to a healthy and longer life as well as to a decrease in stress and in depressive symptoms. Spend time with your friends and family members as well as with people of all ages. In a Mediterranean diet, red meat is not recommended. It involves eating primarily plant-based foods, such as whole grains, fruits and vegetables, nuts, and legumes. It also involves eating fish twice each week, drinking red wine in moderation, and cutting back on salt.